WEST WINDSOR –. 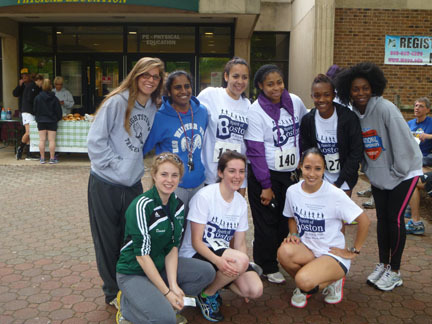 More than 40 runners and walkers came together May 19 to participate in a special fundraiser hosted by Mercer County Community College Women’s Cross Country Team to benefit Boston Children’s Hospital, raising more than $900 for the victims of the Boston Marathon bombings. According to Cross Country Coach Erin Cahill-Wetzel, the event came about when she received a message from team member Sierra Downs during the night of the bombings. 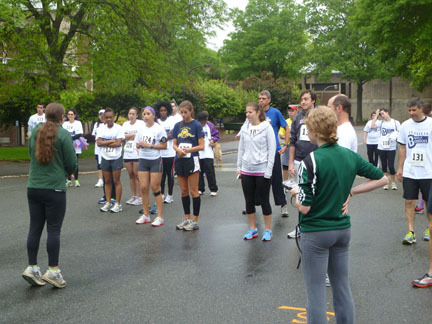 Downs said that as a runner, she felt a special connection to the event – and MCCC’s “Spirit of Boston 5K” was born. “Although we didn’t give ourselves a lot of time to spread the word, we wanted to hold the event as close as possible to the tragedy while it was still fresh on people’s minds,” Cahill-Wetzel said. Event planning quickly got under way, with the first decision being where to send the donations. A cousin of Assistant Coach Chris Wetzel, who works at Boston Children’s Hospital, expressed the hospital’s need for donations. The hospital treated and continues to treat many bombing victims. Through a webpage, signs, and a Facebook page, coaches and runners began spreading the word about the 5K race, and Downs was successful in recruiting local businesses sponsors, including Sabrina’s Ultimate Salon (owned by the mother of runner Karizma Brown), Central Perk & Bagel Company, Princeton Running Company, and Foundations for Learning. Many Mercer Athletics Department members worked the registration table and water stops, and current MCCC team members Diana Taveras, Kira Costantino, Karizma Brown and Melissa Clair participated in the run, along with former team members Anajae Register and Charlay Dingle. The race was won by Greg Wetzel of Chalfont, Penn., with a time of 17:39. The top female overall was Larissa Stycharz of Hamilton, with a time of 21:20. “I am very pleased with how things went,” said Cahill-Wetzel. “I especially want to thank Sierra Downs for her efforts with this race and for initiating the idea. The fact that she immediately wanted to do something demonstrates just how caring a person Sierra really is. I feel fortunate to have had the opportunity to coach such a great person.” Downs graduated from Mercer on May 23 with a degree in Liberal Arts. Donations are being collected for the Boston Children’s Hospital through May 29. Anyone interested in making a donation can do so at the Athletics Office in the MCCC Physical Education Building, 1200 Old Trenton Road, West Windsor, or by contacting Coach Cahill-Wetzel at (609) 570-3741 or cahille@mccc.edu. Those donating $10 or more will receive a t-shirt from the event while supplies last. Runners at the starting line for the Spirit of Boston 5K, sponsored by MCCC's Women's Cross Country Team. Members of the MCCC Women's Cross Country Team prior to the start of the Spirit of Boston 5K fundraiser for Boston Children's Hospital.